Dr. Engkos Achmad Kuncoro, S.E., M.M. Agus Putranto, S.Kom., MT., M.Sc. Idris Gautama So, S.E., S.Kom., M.M., Ph.D.
Deputy Head of Accounting Study Program : Lusianah, S.E. Head of Finance Program : Yen Sun, S.E., Ak., M.Buss. Head of Laboratory – Accounting and Finance : Maya Safira Dewi, S.E., Ak., M.Si. Research Coordinator : Mohamad Heykal, SE, M.Si. Deputy Head of Hotel Management Study Program : Tri Wiyana, S.E. Research Coordinator : Dr. Arif Zulkarnain, S.E., M.M. Head of Communication Study Program : Maria Anggia Widyakusumastuti, S.Sos, M.M. Deputy Head of Communication Study Program : Mia Angeline, S.Kom., M.M. Deputy Head of Communication Study Program (Alam Sutera) : Vivien Sylvina, S.IP., M.A. Head of Broadcasting Laboratory : Drs. Heribertus Sunu Budihardjo. Lecturer Specialist – S3 : Dr. Rahmat Edi Irawan, S.Pd., M.Ikom. Dean : Dr. Ir. John Fredy Bobby Saragih, M.Si. Deputy Head of Architecture Study Program : Ir. Sigit Wijaksono, M.Si. Lecturer Specialist – S3 : Religiana Hendarti, S.T., M.T., Ph.D.
Deputy Head of Civil Engineering Study Program : Meilani, S.T., M.T. Head of Computer Engineering Study Program : Daniel Patricko Hutabarat, S.T., M.T. Deputy Head of Computer Engineering Study Program : Rico Wijaya, S.Kom., M.T.I. Deputy Head of Industrial Engineering Study Program : Karunia Agung Mahardini, S.T., M.Eng. Head of Food Technology Study Program : Dr. Ir. Ingrid Suryanti Surono, M.Sc. Deputy Head of Food Technology Study Program : Dave Mangindaan, S.T., M.T., PhD. Dean : Elisa Carolina Marion, S.S., M.Si. Head of Internationalization & Partnership Program : Arthanami Ekakrisima, S.S., M.Si. Head of Chinese Literature Study Program : Yi Ying, SS, M.Lit., M.Pd. Deputy Head of Chinese Literature Study Program : Theresia, S.S., MTCSOL. Deputy Head of English Literature Study Program : Criscentia Jessica Setiadi, S.S, M.A. Deputy Head of Japanese Literature Study Program : Dhaniar Asmarani, S.S., M.Si. Lecturer Specialist – Native : Masamu Kamaga, B.Eng., M.Eng., Ph.D.
Research Coordinator : Dr. Putri Andam Dewi, S.Sos., M.Si. Deputy Head of Psychology Study Program : A. P. Juni Wulandari, S.Sos., M.Si. Head of Laboratory – Psychology : Esther Widhi Andangsari, M.Psi., Psi. Lecturer Specialist – S3 : Farah Mutiasari, S.Psi., M.Sc., Ph.D.
Research Coordinator : Pingkan C. B. Rumondor, M.Psi, Psi. Head of Law Study Program : Dr.Shidarta, S.H., M.Hum. Research Coordinator : Amalia Sustikarini, S.Sos., MILP. Language Center Manager : Kristianus Oktriono, S.Si., M.M., M.B.A.
Deputy Head of School – Computer Science – Academic & Operation : Yen Lina Prasetio, S.Kom., M.Comp.Sc. Head of Computing Laboratory : Rhio Sutoyo, S.Kom., M.Sc. Head of Mobile Application and Technology Program : Afan Galih Salman, ST, M.Si. Research Coordinator : Wikaria Gazali, S.Si., MT. Lecturer Specialist – S3 : Prof. Dr. Widodo Budiharto, S.Si., M.Kom. Lecturer Specialist – S3 : Dr. Alexander Agung Santoso Gunawan, S.S., M.T,, M.Sc. Lecturer Specialist – S3 : Williem, S.Kom., Ph.D.
Head of Internationalization & Partnership Program : Santy, S.Kom., M.Sc. Deputy Head of School – Information Systems – Student & Alumni : Tanty Oktavia, S.Kom, M.M. Deputy Head of Information Systems Program (Alam Sutera) : Hanny Juwitasary, S.E., S.Kom., M.MSI. Deputy Head of Management Program – Alam Sutera : Yusvin Olivia Sihombing, S.E., M.M. Head of International Business Management Program : Dr. Lim Sanny, ST., MM. Deputy Head of International Business Management Program : Dony Saputra, M.Kom,M.M. Head of Business Creation Program : Dr. Drs. Agustinus Dedy Handrimurtjahjo, M.B.M. Research Coordinator : Dr. Hendry Hartono, S.E., M.M. Lecturer Specialist – S3 : Nugroho Juli Setiadi, S.E., M.M., Ph.D.
Dean of School : Danendro Adi, S.Sn., M.Arts. Head of Visual Communication Design Study Program : Danendro Adi, S.Sn., M.Arts. Deputy Head of DKV New Media Program : Laura Christina, S.Sn. Head of DKV Animation Program : Dermawan Syamsuddin, S.Sn., M.Sn. Deputy Head of DKV Animation Program : Devi Kurniawati Homan, S.Sn., M.Sn. Deputy Head of DKV Animation Program (Alam Sutera) : Frans Santoso, S.Sn., M.Des. Research Coordinator : Dra. Mita Purbasari Wahidiyat, M.F.A. Deputy Head of Interior Design Study Program : Meilani, S.Sn., M.Sn. Head of Internationalization & Partnership Program : Hanny Wijaya, S.Sn.,M.A. Director of BINUS Graduate Program : Prof. Dr. Ir. Edi Abdurachman, MS., M.Sc. Deputy Head of Management Doctoral Study Program : Dr. Ir. Dyah Budiastuti, M.M. Head of AoKI – Mkt, Science & Analytics : Dr. Asnan Furinto, S.T., M.M., M.B.A.
Head of AoKI – Business Inf. System : Dr. Wibowo Kosasih., M.Comm. Head of AoKI – Corp. Strategy & Agility : Dr. Ir. Mohammad Hamsal, MSE., MQM.,M.B.A. Head of AoKI – Finance & Banking : Prof. Dr. Adler Haymans Manurung, M.E., M.Com. Head of AoKI – Entreprship & Innovation : Dr. Sri Bramantoro Abdinagoro, S.T., M.M. Strategic Rsrch & Partnrship Team Leader : Agustinus Bandur, Ph.D.
Head of Computer Science Doctoral Study Program : Prof. Dr. Ir. Edi Abdurachman, Ms., Msc. Research Coordinator : Dr. Ir. Yaya Heryadi, M.Sc. Deputy Head of Master of Information Systems Management Study Program : Drs. Nilo Legowo M.Kom. Lecturer Specialist – S3 : Drs. Tuga Mauritus, M.S., Ph.D. Lecturer Specialist – S3 : Dr. Ahmad Nurul Fajar, S.T., M.T. Lecturer Specialist – S3 : Dr. Sfenrianto, S.Kom., M.Kom. Deputy Head of Master of Computer Science Study Program : Diana, S.Kom., MTI. Lecturer Specialist – S3 : Amalia Zahra, S.Kom., Ph.D. Lecturer Specialist – S3 : Dr. Eng. Nico Surantha, S.T., M.T. Head of Master of Accounting Study Program : Rindang Widuri, S.Kom., M.M., Ph.D.
Head of Master of Communication Study Program : Dr. Muhammad Aras, S.Pd., M.Si. Deputy Head of Master of Communication Study Program : Dr. Z. Hidayat., M.M., M.Si. Dean of BINUS ASO School of Engineering : Dr. Ho Hwi Chie, M.Sc. Head of Automotive & Robotics Engineering Program : Sofyan, S.Kom., M.Eng. Head of Product Design Engineering Program : Ir. Gatot Suharjanto, M.T. Head of Laboratory : Armansyah, S.T., M.Sc. Director : Agus Putranto, S.Kom., M.T., M.Sc. Deputy Head of Online Learning Program : Nuraini Sari, S.E., M.Acc. Vice Rector Academic Development : Dr. Engkos Achmad Kuncoro, S.E, M.M. Accreditation and Academic Quality Assurance Specialist : Iping Suhariadi S.Si., M.Sc., PhD. Accreditation and Academic Quality Assurance Specialist : Diana Lo, S.T., M.Sc., Ph.D. Lecturer Services Center (LSC) Manager : Alvin Chandra, S.Kom., M.M. Software Laboratory Center (SLC) Manager : Indra Dwi Rianto, S.Kom., S.Si., M.T.I. Student Advisory and Development Center (SADC) Manager – Alam Sutera Canpus : Yan Andre Peranginangin, S.Psi., M.Psi. BINUS Career Center (BCC) Manager : Teddy Indira Budiwan, S.Psi, MM. Director : Firdaus Alamsjah, Ph.D.
Bussiness Development Director : Firdaus Alamsjah, Ph.D.
Apple Academy program Director : Gintoro, S.Kom., M.M. Director : Karen Peyronnin Imam, M.I.B. BINUS Global Class Manager : Greta Vidya Paramita, M.Psi., Psi. BINUS Collaboration Center Manager : Theodora Subyantoro-Imbenay, S.Psi., M.Si., Psi. Operations Manager : Huibert Andi Wenas, M.Sc. Director : Nelly, S.Kom., M.M. Director : Dr. Engkos Achmad Kuncoro, S.E, M.M. Deputy Dean, Faculty of Computing & Media : Raymond Kosala, Ph.D.
a. Head of Program – Computer Science : Raymond Kosala, Ph.D.
Deputy Head of Program : Jude Joseph Lamug Martinez, MCS. b. Head of Program – Business Information Systems : Samuel Mahatmaputra T., S.Kom., M.Info.Tech. Deputy Head of Program : Samuel Mahatmaputra T., S.Kom., M.Info.Tech. c. Head of Program – Communication : Christine Pingkan Gneuss, BA, MBA. Deputy Head of Program : Andari Karina Anom, MA. a. Head of Program – Graphic Design & New Media : Novi Dila Kana, S.Sn., MA. Deputy Head of Program : Bayu Prakoso Dirgantoro, MMDes. b. Head of Program – Fashion Design : Ratna Dewi Paramita, MA. Deputy Head of Program : Amanda Prihutomo, ST., MA. 3 Dean, Faculty of Economics & Communication : Gatot Soepriyanto, SE.,Ak.,M.Buss. (Acc), Ph.D.
a. Head of Program – International Accounting & Finance : Gatot Soepriyanto, SE.,Ak.,M.Buss. (Acc), Ph.D.
Deputy Head of Program : Valentina Tohang, SE.,M.Bus(ERP)., M.Bus(Acc). b. Head of Program – Hospitality & Tourism Management : Yuliana, S.ST. Par., MM. Deputy Head of Program : Roozbeh Babolian Hendijani, Ph.D.
4 Dean, BINUS BUSINESS SCHOOL – International Undergraduate Program : Ahmad Syamil, ST., MBA., Ph.D.
a. Head of Program – International Business : Marko S. Hermawan, MIB, Ph.D.
Deputy Head of Program : Lena Choong Sook Lin, B.Sc., MBA. b. Head of Program – Business Management & Marketing : Primidya K.M. Soesilo, S.E., M.Sc., Ph.D.
Deputy Head of Program : Dr. Adilla Anggraeni, B.Bus.,MBA. 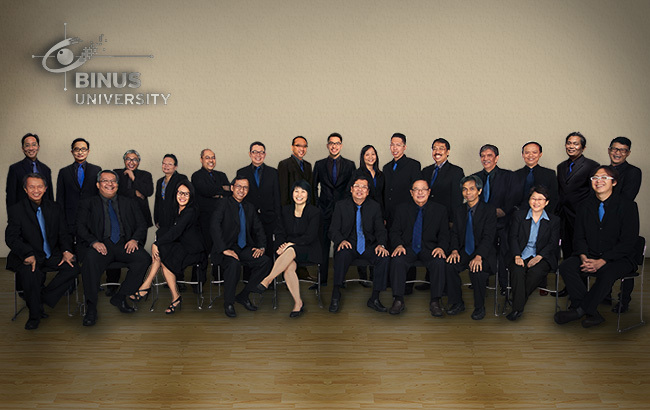 5 Dean, BINUS BUSINESS SCHOOL – Master Program : Dr. Rini Setiowati, SE., MBA. a. Head of Program – Executive MM & Executive Development : Tubagus Hanafi Soeriaatmadja, MBA., M.Si. Deputy Head of Program : Ir. Dewi Tamara, MM., MS.
b. Head of Program – Creative Marketing : Dr. Rini Setiowati, SE., MBA. Deputy Head of Program : Ina Agustini Muwarni, MM., MBA. c. Head of Program – Business Management : Dr. Rini Setiowati, SE., MBA. Deputy Head of Program : Dr. Peri Akbar Manaf, B.Sc., MBA. d. Head of Program – Applied Finance : Dr. Rini Setiowati, SE., MBA. Deputy Head of Program : Dr. Rini Setiowati, SE., MBA. e. Head of Program – MM Blended Learning : Tengku Mohd. Khairal Abdullah, BBA., MBA., Ph.D.
Deputy Head of Program : Willy Gunadi, S.Kom., M.M., Ph.D.
6 Dean’s Office Manager : Veronica, S.Kom, MMSI. a. Dean’s Office Senior Officer : Rininta Ayu Pradhani, S.Si., MM. 7 Director of Academic Development : Ir. Tri Asih Budiono, MIT. a. Research Manager : Adsina Fibra, S.Sos., M.Ed. Research Coordinator : Juliana Berewot, S.Pd., M.Pd. Publication Coordinator : Supria, M.Sc. b. Learning & Faculty Development Manager : Diah Wihardini, B.Sc. (Hons)., M.Ed., Ph.D. Faculty Development Coordinator : Burhanudin, S.Kom., MTI. Curriculum Coordinator : Basori, S.Pd., MS.Ed. c. BINUS Case Center Manager : Sukma Putra, SE., M.Ed. BINUS Case Center Coordinator : Yunita Kartika Sari, S.Sos., MM. Center for Innovation Coordinator : Handrich Kongdro, MM. 8 Quality Management Center Manager : Dr. Dra. Ienneke Indra Dewi, S.Th, M.Hum. a. Quality Assurance Section Head – BUI : Sri Narendro Prasojoyakti, S.Sos. 9.1 Operations Manager : Irma Irawati Ibrahim, M.Kom. a. Head of Academic Operation for BUI : Andi Mulyantara, SE. b. Head of Academic Operation for BBS : R. Deny Lesmana, SE. c. Head of Academic Services : Karshinta Argantini W.P., SE. d. Head of IT Support : Monica Hidajat, S.Kom., MTI. e. Head of Library & Knowledge Center : Imam Budi Prasetiawan, SS. a. Academic Coordinator : Michael Setiawan, M.Hum. b. English Support Services Coordinator : Mark Moloney, B.Sc. Hons. 9.3 Student – Alumni & Global Employability Manager : Hari Kristopo, S.Si., M.S. a. Student Affairs Coordinator : Roosalina Wulandari, M.Psi. b. Alumni & Corporate Relation Coordinator : Yuli Dwi Dianasari, S.Sos. c. Intership & Training Coordinator : Ria Damayanti, S.Sos. d. Career Coordinator : Della Hernita Putri, S.Kom. e. Student Advisory Coordinator : Annisa Dwi Rachmawati, M.Psi. 9.4 Overseas Program Manager : Rokoyah Andariani Amin, MIR&HRMgt. a. International Program Operations Section Head : Irene Zonarosita Dewi, SP. 1 Executive Director : Firdaus Alamsjah, Ph.D.
a. Senior Content Developer : Monica Anggraeni, SE., MM. a. Account Coordinator : Syaripah Mita Hurahmah, S.E. b. Operations Officer – Customized Program : Laras Bening Ayuningtias Tri Waluyojati, S.Kom.